All fixtures and arms are assigned an EPA value (Effective Projected Area) which is defined as the maximum two dimensional area multiplied by the drag coefficient (Cd) designated by AASHTO. The sum of the fixture and arm EPA must not exceed the maximum allowable pole EPA at the selected design	wind speed. The wind map presented is intended to be used as a general guide for selection of a design wind speed. Always consult the local authority that has jurisdiction over the special wind region in order to determine the correct design wind speed. 2009 AASHTO LTS-5 specification 3-second gust basic wind speeds mph) with gust effect factor (G) of 1.14 and 25 year design life wind map (ASCE 7-05) is shown above. 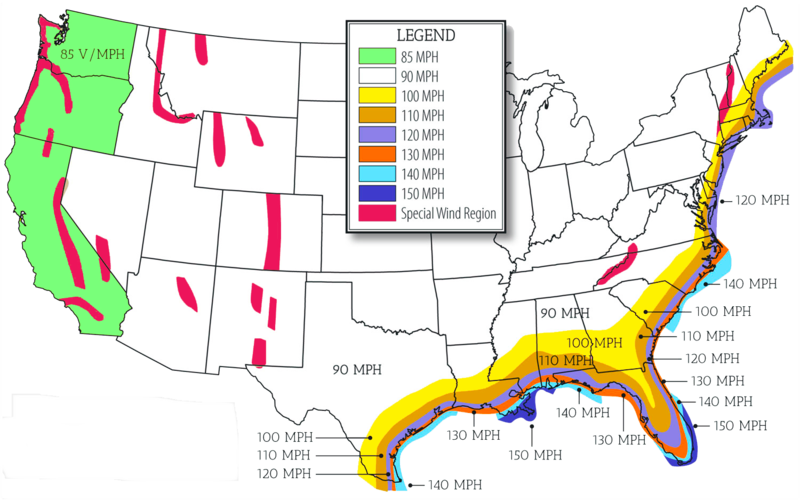 This wind map should be used to determine wind velocity for your specific location. If you are located between two different velocity isotach lines, the higher velocity should be used. Wind speed values are 3-second gust speeds for poles mounted at ground level for exposure C category. Wind map is for basic reference only. ALP will not be responsible for products installed in unusual circumstances where normal wind loads may exceed expectations. Specifiers must select appropriate product accordingly. Poles that are to be installed on structures higher than ground level (such as buildings and bridges) may be subjected to vibration, oscillations, and other fatigue effects, which are not covered by the ALP warranty. The use of banners or other appendages may severely affect the loading of a pole. No banner or other appendages should be attached to a pole unless designed and approved by ALP. Pole foundations should be designed and constructed based on local conditions and/or codes. ALP does not offer recommendations for the foundation of the pole. Poles should never be erected without the luminaire installed. Warranty is voided if the pole is erected without the luminaire. The warranty is voided if the pole is not grouted under the entire base after installation.